Q. Is there a Game Genie for the PS4? Q. Where can I get it?, Can I buy it from a Store? Q. Do I need to modify my PS3 in anyway, will it void my Waranty? Q. Can I reasign profiles to use saves on a different PS3? Q. Is it illegal to cheat games? A. In some regions it is illegal to break any encryption. Q. Does it allow cheating of online games? Q. What cheats are available? Q. 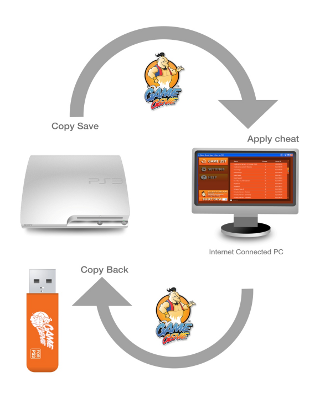 Isn't Game Genie just like the PS3 Action Replay or Xploder products? Q. Can I see Game Genie in Action? Q. Game Genie isn't that by Galoob/Codemasters? A. This version of Game Genie is not related to Galoob or Codemasters, however in the past we have worked on cheat devices such as GameShark, Action Replay, Xploder, Codebreaker etc. so we think we know a bit about cheating! Q. OK, I want one, how do I get it? PlayStation 3 is a trademark of Sony Computer Entertainment. This product is not endorsed, sponsored or manufactured by Sony Computer Entertainment. Game names are copyright of their respective owners.